Ethereum represents one of the most interesting technological developments in the past few years, taking the fundamental principles of a blockchain, and allowing executable “contracts” to be written. These contracts can be relatively simple but also incredibly powerful. This post will walk you through setting up a development environment so that you can deploy and test your own smart contracts on the Ethereum test blockchain (“Ropsten”). Parity is a fast Ethereum browser, a tool which allows you to interact with the blockchain. On my laptop at least, it is significantly faster to synchronise and use than geth, which is probably the “standard” tool for interacting with the Ethereum blockchain. You’ll see a stream of stuff fly by in the terminal as Parity connects to the testnet, and starts the process of synchronising the blockchain. This might take a while…but rest assured it’s much faster than using the Ethereum Wallet app. While you wait, you can still get started using Parity through its lovely web interface. 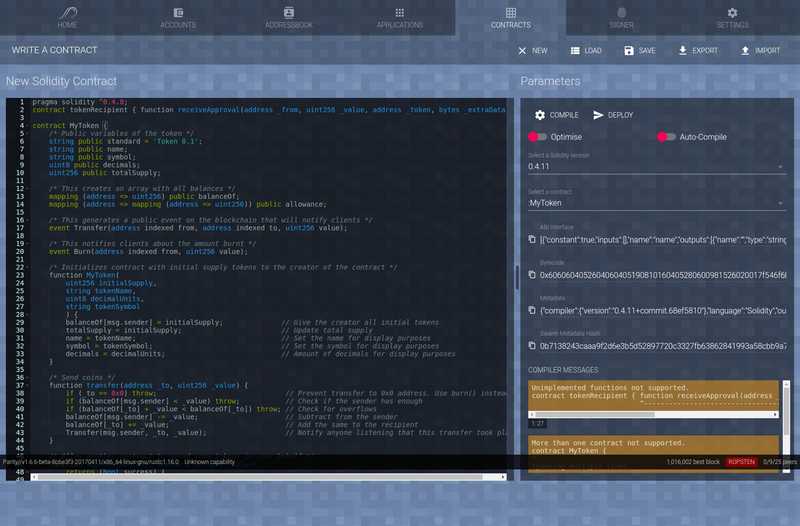 Parity comes with a really nice, fully featured web interface. This allows you to view and create wallets (where you keep your Ether), interact with other apps and to create or interact with Contracts. 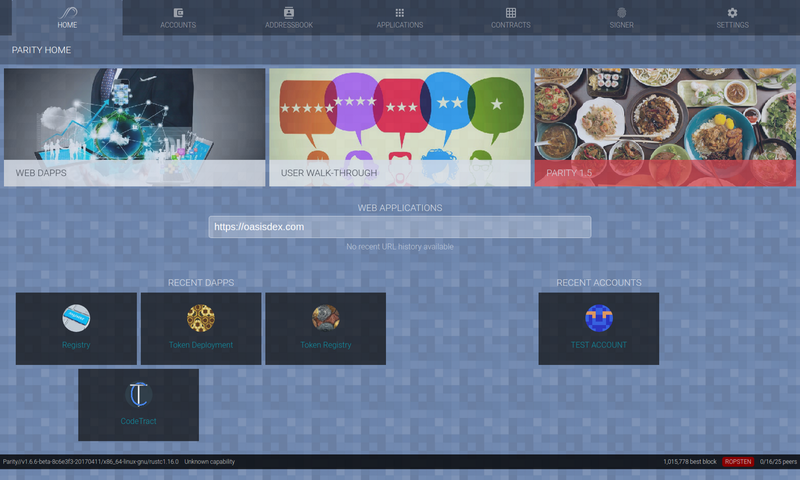 When you first launch the web interface, it will guide you through creating a wallet. Use a strong password, but remember as this is on the testnet, the Ether you collect here aren’t anywhere near as valuable as “real” Ether. After a bit of time trying the first two options, I resolved to mine my own Ether, and it wasn’t too hard. Ethminer is a separate tool which talks to the blockchain via Parity with the aim of validating the transactions that occur. As a reward for validating the transactions, you will occasionally receive some Ether. It’s not super quick to receive the Ether, but it’s pretty quick to setup, so I just left it for a few hours and came back to almost 100 Ether in my wallet. WooHoo! Note: The -G option enables GPU mining, which speeds it up. However, this does assume you have a suitable card and have set up your using the appropriate graphics card drivers etc. If it doesn’t work, try again without the -G.
Again, you’ll see a wall of stuff stream past — this is ethminer starting to do its business. I left it for a few hours and came back to some Ether. Once you have some Ether, you can stop mining and start writing! 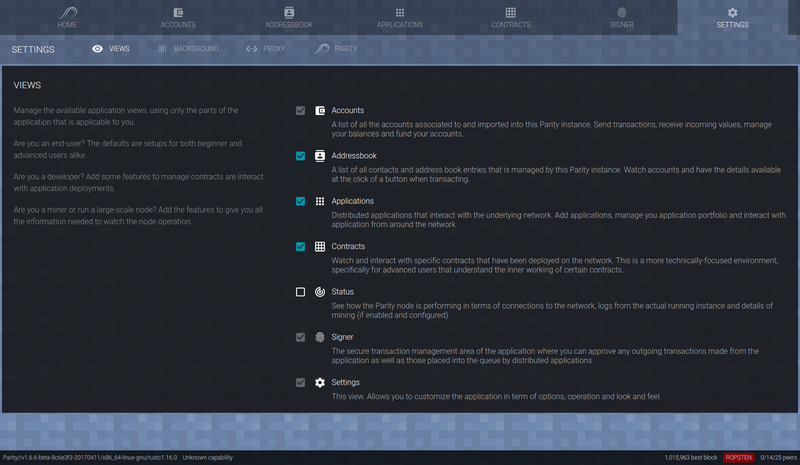 Parity has a built in contract development tool, which is pretty nice. Make sure you can see it by going first to the Settings in the Parity web interface and ensuring it is enabled. Now you can go to the Contracts tab, hit the Develop button and you’re ready to go! As for what to write, that’s for another article. You can get started with your own cryptocurrency and learning more about Solidity, one of the languages used to programme smart contracts. But you now have all the tools and some Ether! Hey, I’m Joshua, a Product Manager and data fan. This is my blog and a place to post random musings and tutorials.